Service Provider of a wide range of services which include thermal spray aluminium coating on derricks., thermal spray aluminium coating for high temperature corrosion, thermal spray aluminium coating for anti-corrosion purpose, thermal spray aluminium coating on furnace parts, thermal spray aluminium coating on condenser and thermal spray aluminium coating on reactor. Thermal Spray Aluminium Coating is the best solution for corrosion protection. It is applicable in the areas where temperature and marine region. Metatech Thermal Spray Pvt. Ltd. has a huge experience in the field of Thermal Spray Aluminium Coating. We provide high quality coating which gives a life of more than 20 years to components surrouded by highly corrosive atmosphere. 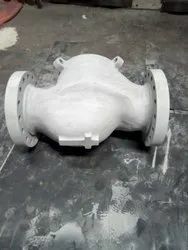 We have done Thermal Spray Aluminium coating according to specification of Shell, Petrofac, Petrobras, Exxon Mobil, EIL, Reliance, GE and many more. Metatech Thermal Spray Pvt. Ltd. is one of the Largest companies in the field of Thermal Spray Aluminium Coating in India. Thermal Spray Aluminium Coating is very useful for protection against corrosion in Heat Exchangers. Thermal Spray Aluminium Coating has Excellent properties for high temperature application. Thermal Spray Aluminium Coating provides excellent corrosion protection in marine condition where the environment is excessive corrosive. Metatech Thermal Spray Pvt. Ltd. is one of the largest company in India in the field of Thermal Spray Aluminium Coating. Thermal Spray Aluminium Coating is very useful for protection against corrosion. 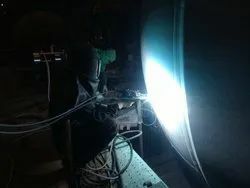 Thermal Spray Aluminium Coating is done over the components having temperature -20 degree to 540 degree Celcius, that means it is a beneficial for high temperature application. 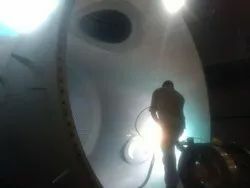 Thermal Spray Aluminium Coating provides excellent corrosion protection in marine condition where the environment is excessive corrosive.Thermal Spray Aluminium Coating provides 15-20 years of protection to Furnace Parts for Preventing High temperature corrosion. Metatech Thermal Spray Pvt. Ltd. is one of the largest company in India in the field of Thermal Spray Aluminium Coating. Thermal Spray Aluminium Coating is very useful for protection against corrosion. Thermal Spray Aluminium Coating is done over the components having temperature -20 degree to 540 degree Celcius, that means it is a beneficial for high temperature application. 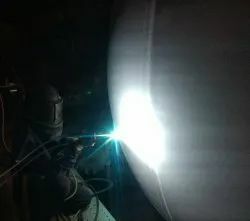 Thermal Spray Aluminium Coating provides excellent corrosion protection in marine condition where the environment is excessive corrosive.Thermal Spray Aluminium Coating provides 15-20 years of protection to component. Metatech Thermal Spray Pvt. Ltd. is one of the largest company in India in the field Thermal Spray Aluminium Coating over Valve of Oil and Gas Refinery. Thermal Spray Coating provides extreme wear resistance. Excellent Service life. Highly Corrosion Resistant. No Drying or Curing time required. No health hazards. Low operating temperature. Operating Temperature range: -45ºC to 538ºC. Thermal Spray Aluminium Coating is the best solution for corrosion protection. It is applicable in the areas where temperature and marine region. Metatech Thermal Spray Pvt. Ltd. has a huge experience in the field of Thermal Spray Aluminium Coating. We provide high quality coating which gives a life of more than 20 years to components surrouded by highly corrosive atmosphere. Thermal Spray Aluminium Coating over Header Box of Air Finned Cooler Thermal Spray Coating provides extreme wear resistance. This jobs were done for Petroleum Development of Oman(PDO). 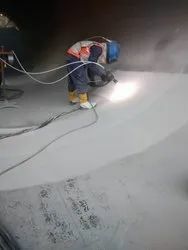 Thermal Spray Aluminium Coating has Excellent Service life.Thermal Spray Aluminium Coating is Highly Corrosion Resistant.Thermal Spray Aluminium Coating needs No Drying or Curing time required. No health hazards. Low operating temperature.Thermal Spray Aluminium Coating has Operating Temperature range: -45ºC to 538ºC. Thermal Spray Aluminium Coating is the best solution for corrosion protection. It is applicable in the areas where temperature and marine region. Metatech Thermal Spray Pvt. Ltd. has a huge experience in the field of Thermal Spray Aluminium Coating. We provide high quality coating which gives a life of more than 20 years to components surrouded by highly corrosive atmosphere. We have done Thermal Spray Aluminium coating over many equipments of EIL. Thermal Spray Aluminium Coating is the best solution for corrosion protection. It is applicable in the areas where temperature and marine region. Metatech Thermal Spray Pvt. Ltd. has a huge experience in the field of Thermal Spray Aluminium Coating. We provide high quality coating which gives a life of more than 20 years to components surrouded by highly corrosive atmosphere. We have done Thermal Spray Aluminium coating as per ONGC Specifications for Offshore Platforms. Thermal Spray Aluminium Coating is the best solution for corrosion protection. It is applicable in the areas where temperature and marine region. Metatech Thermal Spray Pvt. Ltd. has a huge experience in the field of Thermal Spray Aluminium Coating. We provide high quality coating which gives a life of more than 20 years to components surrouded by highly corrosive atmosphere. We have done Thermal Spray Aluminium coating as per Petrobras Specifications for Heat Exchangers. Thermal Spray Aluminium Coating is the best solution for corrosion protection. It is applicable in the areas where temperature and marine region. Metatech Thermal Spray Pvt. Ltd. has a huge experience in the field of Thermal Spray Aluminium Coating. We provide high quality coating which gives a life of more than 20 years to components surrouded by highly corrosive atmosphere. We have done Thermal Spray Aluminium coating Projects according to specification of Shell. Thermal Spray Aluminium Coating is the best solution for corrosion protection. It is applicable in the areas where temperature and marine region. Metatech Thermal Spray Pvt. Ltd. has a huge experience in the field of Thermal Spray Aluminium Coating. We provide high quality coating which gives a life of more than 20 years to components surrouded by highly corrosive atmosphere. Thermal Spray Aluminium Coating is done by us over External and Internal Surface of the tanks and vessels for high corrosion resistance. Thermal Spray Aluminium Coating is the best solution for corrosion protection. It is applicable in the areas where temperature and marine region. Metatech Thermal Spray Pvt. Ltd. has a huge experience in the field of Thermal Spray Aluminium Coating. 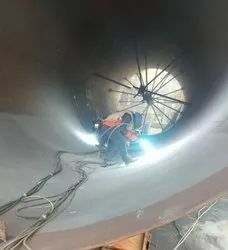 We are doing Thermal Spray Aluminium Coating in internal Surface of Chimney for Corrosion protection. It provides a life of more than 10 years which is not achievable by any other protective coating. So Thermal Spray Aluminium Coating is the best method for Corrosion protection. Metatech Thermal Spray Pvt. Ltd. is one of the largest company in India in the field of Thermal Spray Aluminium Coating. Thermal Spray Aluminium Coating is very useful for protection against corrosion. Thermal Spray Aluminium Coating is done over the components having temperature -20 degree to 540 degree Celcius, that means it is a beneficial for high temperature application. Thermal Spray Aluminium Coating provides excellent corrosion protection in marine condition where the environment is excessive corrosive.Thermal Spray Aluminium Coating provides 15-20 years of protection to Heat Exchangers. Metatech Thermal Spray Pvt. Ltd. is one of the largest company in India in the field of Thermal Spray Aluminium Coating. 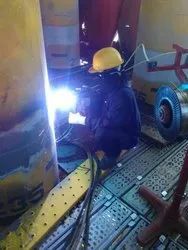 Thermal Spray Aluminium Coating is widely used for coating structures of Offshore Platforms. Offshore Platforms are surrounded by water body, which a severe corrosive atmosphere. To protect the Offshore Platforms from rusting Thermal Spray Aluminium Coating is done. Thermal Spray Aluminium Coating provides 15-20 years of protection to Offshore platforms. Metatech Thermal Spray Pvt. Ltd. is one of the largest company in India in the field of Thermal Spray Aluminium Coating. Thermal Spray Aluminium Coating is very useful for protection against corrosion. Thermal Spray Aluminium Coating is done over the components having temperature -20 degree to 540 degree Celcius, that means it is a beneficial for high temperature application. 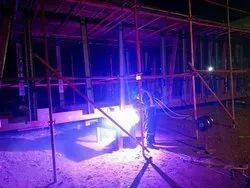 Thermal Spray Aluminium Coating provides excellent corrosion protection in marine condition where the environment is excessive corrosive.Thermal Spray Aluminium Coating provides 15-20 years of protection to structural steel.